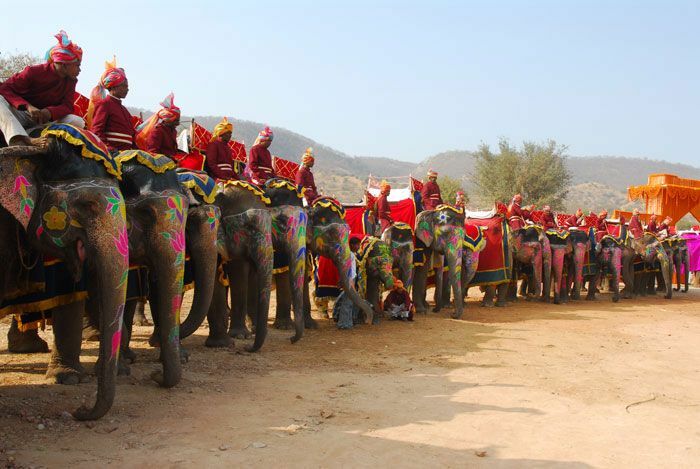 City of Amber-At a Distance of 11 Kms, from Jaipur the Amber fort complex stands amidst wooded hills. One of the finest examples of Rajput/Mughal architecture. Built in 16th century it stands as a testament reflecting the glory of the fierce Kachawaha Dynasty that ruled over the region from 12th to the 18th century. Half day tour to the deserted city of Amber Fort and Palace and return to Jaipur via Ram Niwas Garden. 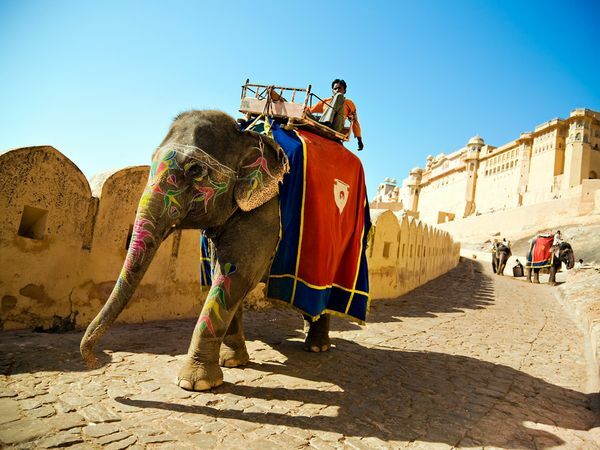 from Jaipur and was the ancient citadel of the ruling Kachhawa clan of Amber, before the capital was shifted in the plains to present day Jaipur. 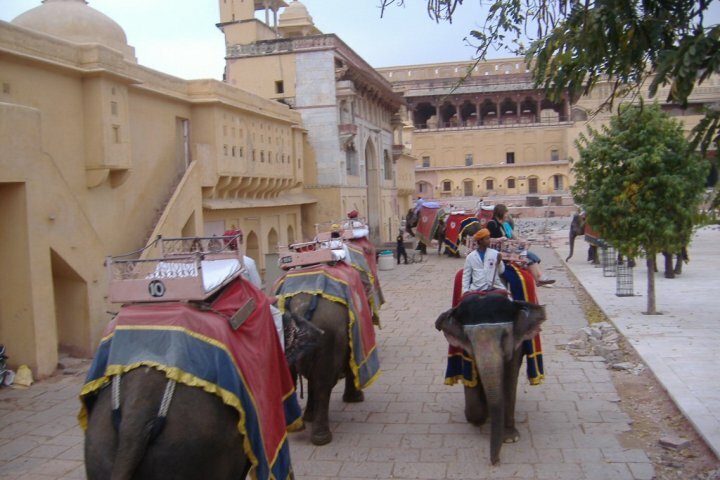 Sightseeing Tour of Amber Fort with Elephant Ride Jaipur View The Amber Fort set in picturesque and rugged hills is a fascinating blend of Hindu and Mughal architecture. Constructed by Raja Man Singh I in 1952 and completed by Sawai Jai Singh I the fort is made in red sand stone and white marble. The rugged forbidding exterior belies an inner paradise with a beautiful fusion of art and architecture. Amber is the classic and romantic fort- palace with a magnificent aura. The interior wall of the palace depicts expressive painting scenes with carvings, precious stones and mirror settings. In the foreground is the Maota Lake providing a breathtaking look. Built mainly for the warring enemies as a safe place, the heavily structured walls could defend the residents within the ramparts of the fort. 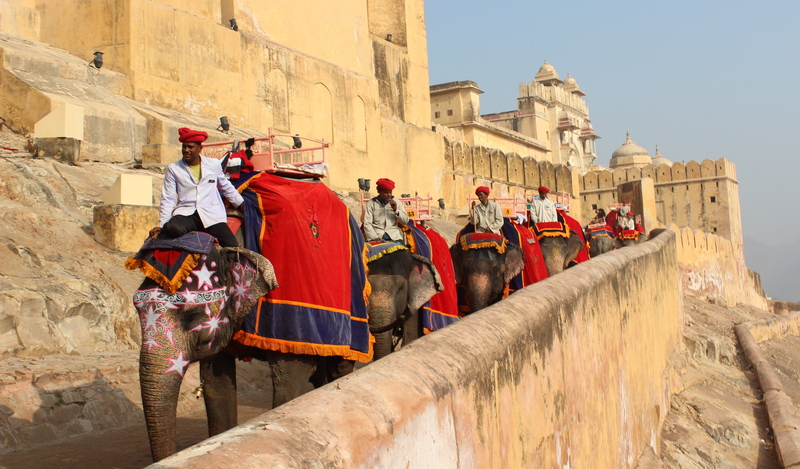 fort has 4 sections; each with the premises and one has to climb up through the imposing stairway or else the broad aisle, where one can ride on the elephant back for royal feel. The main gate Surajpol that leads to the Jaleb chowk, which is the main courtyard from where one can walk up the stairway, that leads to the palace. Jaleb Chowk was also the area where returning armies were welcome and they would display their war earnings to the population at large. Before you enter the palace just towards the right is a sleep aisle and a narrow staircase reaching up to Kali Temple also called Shila Devi Temple famous for its mysterious history and the huge silver lions. It is a gorgeous temple featuring silver doors with raised relief. According to a legend, Maharaja Man Singh I had worshiped the Goddess for a victory over the rulers of Bengal. The Goddess appeared in the Maharaja’s dream and ordered him to recover her statue lying under sea near Jessore (now in Bangladesh) and install it in a befitting Temple. True enough, after subjugating the enemies the Maharaja recovered the statute from the bed of the sea. The temple is called after Shila Devi, “shila” meaning stone slab. Like all temples this too has an image of Ganesha on the doorway, but carved from a single piece of coral. Behind the exquisite and fabulous Ganesh Pol, “pol” meaning gate are located in the residential apartments of the Maharaja. The Jai Mandir, the Hall of Victory is famous for its inlaid panel and dazzling mirror ceiling. Much of it had deteriorated with neglect and is under restoration. On the other side is Sukh Niwas, the residence of pleasure or pleasurable residence. The palace has an ivory inlaid sandalwood door. A channeled laid for flow of water is an inventive system of cooling. The water flowing from the channel wasn’t wasted as it was allowed to flow in the garden. From there you can also take pleasure in viewing of the fort rampart and its reflection in the Moata Lake.